Kerala is described as the secular co-existence and religious harmony. Many temples, mosque and churches are located in the different parts of Kerala which offers the holistic feeling, happiness, peace and calmness. This cultural and religious diversity in the state hosts a number of religious festivals throughout the year. Almost every temple or mosque in Kerala has its own festival which is celebrated annually by the devotees with full devotion. In all festival elephant is decorated with traditional pattern with gold and silver ornaments. These animals have special place in the heart of people of Kerala. Because of many temples, mosque and church it gives an awesome feel which can be felt only after visting this place. So Kerala can truly be called a secular state of India. Normally in Kerala churches or mosque is referred as “Pally”. Kerala in the state where first church on the land of India was built.Islam came to India with the arab merchants and traders on the Malabar Coast.Mosques have a beautiful architectural designs carved out in stones and wood. Sri Padmanabhaswamy Temple is situated in Thiruvananthapuram, the capital city of Kerala.Sri Padmanabhaswamy temple’s main deity is Lord Vishnu. This temple is a blend of the Kerala and Dravidian styles of architecture. 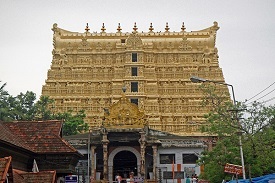 The history of Sri Padmanabhaswamy Temple dates back to 8th century. The presiding deity of this temple is Lord Vishnu, reclining on Anantha, the hooded Serpent. Marthanda Varma, the noted among Travancore kings did a major renovation to the temple and it resulted in the present day structure of the Sri Padmanabhaswamy temple. It was Marthanda Varma who introduced the Murajapam and Bhadra Deepam festivals in the temple. Thiruvananthapuram, the capital city takes its name from the presiding deity of the Sri Padmanabhaswamy temple, who is also known as Anantha (one who reclines on the Serpent Ananatha). The word 'Thiruvananthapuram' literally means - the land of Sree Anantha Padmanabhaswamy. The idol of the presiding deity of the Sri Padmanabhaswamy Temple is noted for its composition, which has 12008 salagramams, which were brought from Nepal, taken from the banks of the River Gandhaki.It is one of the wealthiest temple in India. the temple is embedded with assets like gold, jewels, three-and-a-half feet tall gold idol of Mahavishnu studded with rubies and emeralds, ceremonial attire for decorating the deity consists of 16-part gold anki weighing almost 30 kilograms (66 lb) together with gold coconut shells, one studded with rubies and emeralds. The idol can be viewed through three different doors. The head and chest are seen through the first door; while the hands can be sighted through the second door and the feet through the third door. Attukal Bhagavathy Temple, one of the ancient temples of South India, is popularly described as Sabarimala of the Women, as women form the major portion of devotees. The Goddess in the temple of Attukal is worshipped as the Supreme Mother, creator of all living beings and the mighty preserver as well as destroyer of them all. The pilgrims from all over the country, who visit Sree Padmanabha Swamy Temple and worship the Lord, do not consider their visits complete without the visit to the shrine of the supreme Mother Attukalamma. Vishnumaya took the incarnation of Bhagavathy to annihilate the evil and protect the good in the world in the present Era namely Kaliyuga. History:- According to mythology, Attukal Bhagavathy is supposed to be the divinised form of Kannaki, the famous heroine of Chilapathikaram, written by Elenkovadikal, the Tamil Poet. The story goes that after the destruction of ancient city of Madurai, Kannaki left the city and reached Kerala via Kanyakumari and on the way to Kodungalloor took a sojourn at Attukal. Kannaki is supposed to be the incarnation of Parvathy, the consort of Paramasiva. The all powerful and benign Attukal Bhagavathy reigns eternally supreme at Attukal and nurses devotees as a mother does her children. Thousands of devotees from far and near flock to the Temple to bend before the Goddess with awe and reverence to prostrate and redress their affliction and agony. Aesthetics of Architecture:- Anyone visiting the Attukal temple is first struck by the beauty and charm of the temple architecture. The temple structure is a harmonious conglomeration of both Kerala and Tamil styles of architecture. The beautifully carved figures of Mahishasuramarddini, Goddess Kali, Rajarajeswari, Sree Parvathy with Lord Paramasiva and various other depictions of the Goddess in and around the temple are undoubtedly the work of a gifted artist. Equally well presented around the corridors surrounding the temple, are the depiction of various other Gods and the epic stories of the ten incarnations of Lord Vishnu viz., the "Desavathara". On either side of the elegant front gopura - are the icons based on the story of Goddess Kannaki. On the southern Gopura, the puranic story of "Dakshayaga" is depicted in sculptures. The decorated gate at the entrance of the temple is by itself an excellent example of architectural beauty. Lokanarkavu Temple is located at Memunda, which is 5 km away from Vadakara /Vatakara, in North Malabar region of Kerala. 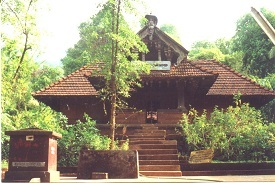 Lokanarkavu Temple is the more popular name of short name of Lokamalayarkavu. The whole term Lokamalayarkavu comprises of four words - ‘Lokam’ meaning world, ‘Mala’ meaning mountains, ‘Aaru’ meaning River and ‘Kavu’ meaning grove. The temple officially belongs to five hundred Aryan citizens who came to Kerala to settle down here, as well as their successors. It is believed that Aryans constructed the temple some 1500 years ago. The Idol of the mighty Durga is worshipped in Lokanarkavu Temple. Two temples, each dedicated to Lord Vishnu and lord Shiva, are also located in the vicinity of the temple. The Durga temple was built by Aryans Vaishya Brahmins who migrated to this place some 1500 years back. They were Brahmins who took up trade as their main occupation. The Aryan successors of these temple still are of prime importance in the temple. They gradually began to accept some of the traditions of local Nairs and made martial relationship with them. But on close examination their customs and beliefs are evidently different from local Nair community. It is believed that the goddess traveled with them to Lokanarkavu in the form of a lady who followed the five hundred Aryans. The successors still see this goddess as their mother and not as goddess. Often the name of Thacholi Othenan is misquoted with the origin of temple. Othenan was a great devotee,but never had any holding rights or anything to do with the establishment of Durga temple. It is evident from the fact that the goddess is Durga at Lokanarkavu and not the Kali form. The heroes of Vadakkan Pattukal had their ancestral goddesses as Kali form and not Durga form. The same applies to the local rulers who later claimed Lokanarkavu as their family goddess. All the rulers of Kerala had Goddesses with Thamasa pooja or shakteya pooja; ie poojas in which either man or animal was sacrificed. It was a more local tradition and most family temples of Kerala kings and locals had followed such tradition until it was modified.Later due to Aryanisation of temples, modifications were made by replacing human sacrifice with cutting plantain or performing poojas with tender coconut and cereals meant to replace liquor and meat. Unlike this local tradition Lokanarkavu durga temple do not have any such traditions and never had such practices as it was established by Aryans itself. It is said that most other goddess temples in Kerala are in Madhyama and rarely in Uthama state. But this temple is said to be in Athyuthama state. The Aryans though manifested as locals they strongly upheld their ethical roots through a complex of differences from rest of the people. The race spirit was so high at older times that it is said that they refused to pay taxes to the local kings of Kerala,as none of them was an Aryan. But at the same time or say at a later period they began to ignore the cast restrictions and even seemed to threaten the cast equations. But slowly they became adjusted and more reclusive and settles around the temple areas and withdrew from all other matters of Local people. Among the mandala vilakku festival, the successors of these Aryan Vaishya Brahmins migrants conduct the 16th vilakku, thats on 16th day and is of prime importance. As we enter the temple we must pray to the stage kept in memory of these Aryan Brahmin Ancestors who built the temple. The stage is at right side to the main entrance and all devotees must seek their permission and pray to them to see the goddess inside. This is to show that the Lokanarkavu Durga holds these people to the highest esteem and she had followed them where ever they went and their happiness is her prime importance. It is said that the prayers done without praying to these ancestors goes much unheard. In short it is a place of a never experienced tradition in Kerala. Muthappan Temple, also called Parassinikadavu Muthappan temple is a Hindu temple, located on the banks of the Valapattanam river about 10 km from Taliparamba in Kannur District, Kerala. Muthappan is a Hindu deity worshipped commonly in Kannur district of north Kerala state, South India. Worship of Muthappan is unique, in that it does not follow the Sattvic (Brahminical) form of worship, as in other Hindu temples. The main mode of worship is not via idol worship, but via a ritual enactment of Muthappan, performed daily at the Parassinikadavu temple. Fish is used as an offering to Muthappan, and people of all castes, religions and nationalities are permitted to enter the temple and take part in the worship. Parassinikadavu Madappura Sree Muthappan Temple is not a Kshethram but it is a madappura. Unlike other temples, the devotees can 'interact' with the God as they pour out their grievances in a freewheeling 'chat' with the tastefully decorated "Muthappan Theyyam", an artist who assumes 'divinity' by representing the God. The theyyam responds with convincing solutions, which are believed by the devotees as sacred and that of the God. Muthappan theyyam then parts with the liquor and elder male devotees take it as ‘necter’ while the other offerings are set apart for dogs, considered the Lord’s pet animal, which eagerly wait outside the temple to pick up the dishes.Sree Muthappan is always accompanied by a dog. Here dogs are considered sacred and can be seen in large numbers around the temple. Two carved bronze dogs at the entrance of the temple symbolize the bodyguards of the God. When the Prasadam is ready, it is first served to a dog that is always ready inside the temple complex.In normal days the Sreekovil Nada opens at 4 am in the morning. After that the procession accompanying “thalavadyas” (musical performance with traditional instruments such as Chenda, Chengila, Kombu, Kuzhal etc.) brings the “thiruroopam” (holy statue) to the Sreekovil. After bringing the thiruroopam, the usual conversation of Sree Muthappan with his Madayan begins. In such conversation Sree Muthappan will open his mind to his Madayan and the Madayan accomplishes the wishes of the Lord. Toddy, an alcoholic drink extracted from coconut palms is the main offering to the deity. Saraswathi Temple temple in the Panachikadu village of Kottayam district, Kerala is known as Dakshina (Southern) Mookambika Temple.It is a Hindu temple dedicated to the goddess Saraswati. 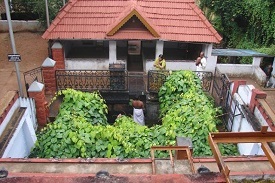 The Panachikkadu Saraswathi Temple has Vishnu as the main deity. Myths say that there once lived a poor but pious Brahmin who was a devotee of Kollur Sri Mookambika Devi and that he used to visit Kollur temple every year. As the Brahmin grew old, his health worsened and on one of his trips to Kollur, he realized that he could no longer visit Mookambika again due to his poor health. As he returned to Panachikkadu, it is said that the Goddess Mookambika came mounted on his palm-leaf umbrella and settled at the present location at Panachikkadu Temple. The ceremony of Vidyarambham (formal initiation into the letters of the alphabet) for the children is held on Vijayadashami (last day of Navaratri) day. On that day thousands of people arrive at this temple to initiate learning to their children. A major cultural festival of classical dance and music is held in the temple for the duration of the nine nights to coincide with the festival.Panachikkadu Temple is situated at Panachikkadu Panchayat. In the Main Central Road (MC Road), between Changanacheri and Kottayam, there is a small town Chingavanam. Travelling 4 kilometers east from Changavanam one can reach the temple situated in an idyllic and beautiful place Panachikkad.When we reach the precincts of the temple we see first a “Vishnu temple “.just a few metres south of the Vishnu shrine we can see the ‘saraswathy temple’ in a natural valley with the water dripping and flowing around the idol. In the ‘lthihyamala’of kottarathil sankunni there is a detailed description of this temple-this temple having more than one thousand years of history, there are three Brahmin families, kizhupuram,Karunad and kaimukku,asits traditional care takers. From among these illams a respectful Brahmin from the kizhupurathillam disappointed by not getting a male child, took up a journey to Ganges to take holy bath. On the way reaching mookambika he stayed there for a few days praying to the deity there. One day the devi appeared before him and advised him to go back to his native place. She told him that a nampoothiri lady of Karunattillam is now pregnant and that she will deliver two children. One of the children be adopted by him as his own and bring him up. As directed by the devi the next day the devotee took bath, worshipped the devi and returned to his house. In his palm leaf umbrella there was Devi’s blessing and power. When he reached Panachikad,the palm umbrella become stiff without any movement. then holy Godman appeared before him and pronounced that there is devi’s power and blessings in the umbrella. He advised the Brahmin to do poojas and the power of saraswathy be installed in a temple at Panachikadu. An idol which was lying deserted there was seen. The Brahmin was told to incarnate the power of the devi in this old idol which was worshipped by Godman with supernatural power long time ago. Since such Godmen with supernatural powers are not available now an alternate idol was installed in Panachikad.Even today in the temple of the care takers traditional rituals and poojas are performed as of then. The order in which Pooja performed to Mahavishnu, sarawathy, Ganapathy, Siva, Sastha,Yakshii, and Nagaraja. Like the Ganges which touches the feet of Vishnu it is form the feet of Vishnu that the holy water flows to the shrine of Saraswathyi. 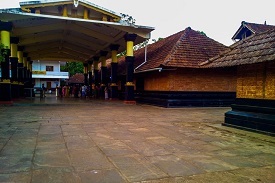 The Peralassery Subramanya Temple, is located 15 kms from Kannur. Peralaserry Subramania Temple along with Payyanur Subramania temple is probably the most important and must visit Subramania Temples in Kerala. The story or “Aithihyam” behind this temple is unique and has it’s roots in the Ramayana epic. 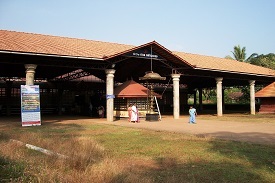 It is also believed that people who visit Peralaserry temple must also visit the nearby Makrery temple. It is believed that the Subramania Peralassery Temple is a place where Lord Sri Rama along with Lakshmana halted on their way to Sri Lanka, in their search and endeavour to rescue Sita Devi from Ravana’s imprisonment. The main “vazhipaddu” or offerings in this temple are “Subramania Puja” and “Mutta Oppikal” (offering of eggs to the revered snake deity). The main deity of this temple is Lord Subramania.The Stepped Pool/Tank or “Chira” of the Peralassery Subramania temple is a magnificent structure. The week-long Kodiyettam festival associated with the Peralassery Subramanya temple is in the Month of December, every year. Rajarajeswara Temple is situated 20 km from Kannur of Kerala state, south India. It is near Taliparamba town, famous for its spices trade. The temple is believed to have got the name from Thiru Shambara or the holy shambara in reverence to Maharishi Shambara.The temple also contains one of the most exquisite collection of mural paintings in south India. Trichambaram Temple has three ponds attached to it, with the temple for Durga being surrounded by water on all sides. This temple has a prominent place amongst the numerous Shiva temples in South India. If any problem is encountered in temples of South India, the final solution is sought in this Temple through a prasna, a traditional method of astrological decision making. The prasna is conducted on a peedha (a raised platform) situated outside the temple. Taliparamba is one among 108 Shiva Temples in Kerala(ancient Kerala from Gokarnam to Kanyakumari) created by Lord Parasurama. Among these temples 12 are considered as most important and called Dwadasa Shivalayas(12 shiva temples). They are Gokarnam Mahabaleswara Temple(now in Karnataka), Taliparamba Rajarajeswara Temple, Kottiyoor Perumal Temple, Thrissur Vadakkunnatha Temple, Peruvanam Mahadeva Temple, Kodungalloor Thiruvanchikkulam Mahadeva Temple, Vaikom Mahadeva Temple, Ettumanoor Mahadeva Temple, Kaduthuruthy Mahadeva Temple, Chengannur Mahadeva Temple, Kandiyoor Mahadeva Temple and Suchindram Sthanumalaya Perumal Temple(for more details about these temples visit 108 Shivalya page). Architecture:-The quadrangular sanctum has a two tiered pyramidal roof. In front of the sanctum is the namaskara mandapam. The temple has no kodi maram (flagstaff) as opposed to other temples in Kerala. The balikkal has no roof but is embellished by a mysterious figure with a peculiar face. In front of the balikkal is a small rectangular building with a pyramidal roof, which is not usually found anywhere else. An inscription on the structure of the temple tank (which is a little away from the temple on the north side) indicates that the temple and the tank were renovated in 1524 A.D. Glory of Namaskaramandapa:-The Namaskara Mandapa (mukha mandapa) infront of the Sreekovil(sanctum sanctorum) is the place where Lord Sree Rama (on his way back to Ayodhya from Lanka after defeating Ravana) prostrated before Raja Rajeswara. As a respect to Sree Rama no one is allowed into this namaskara mandapa and offer prayers, which is permitted in other temples for Brahmins. 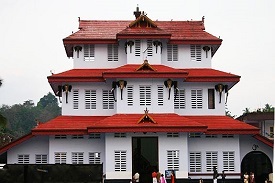 Kottiyoor or Kottiyur is a famous Hindu pilgrim center devoted to Lord Shiva and Goddess Parvati. 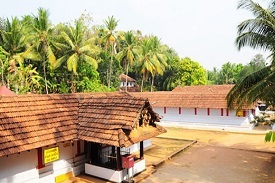 The proper name of the temple here is Sri Kottiyoor Mahadeva Kshetram. Kottiyoor temple is located near Kelakam in Kannur district of the southern state Kerala. Sri Kottiyoor temple is also known as the "Dakshina Kashi" or "Varanasi of the South" and attracts lakhs of devotees every year during the "Vaisakha Maholsavam" celebrations. Daksha is son of Brahma and one of the Prajapatis. Sati, the consort of Shiva was the daughter of Daksha. Sati had married Shiva against the wishes of her father. The vain Daksha performed a great yagna/ yaga(with the sole aim of insulting Shiva), to which he invited all of the gods and goddesses except his son in law Lord Shiva. Against Shiva's wishes, Sati attended this yagna and was insulted by her father. Unable to bear this insult, Sati immolated herself in the yagna fire.Enraged at the loss of Satidevi, Shiva opened his third eye. Then appeared Veerabhadra with a 1000 arms and carrying weapons in each hand. He destroyed Daksha's sacrifice and cut off Daksha's head.Since the yaga was stopped, the Gods feared that many difficulties may arise in the future. The Gods along with Brahma and Vishnu went to Kailas and sought Shiva's help. Shiva was pacified and all of them reached the yaga place and restored the yaga. The dead were brought back to life. Daksha's head was destroyed in the yaga fire and was replaced by a goats head. Daksha pleaded to Shiva for his arrogance and was given Moksha.After the yaga, every one went back and Lord Shiva took the form of the swayambhu linga next to where Sati immolated herself in the yagna fire. Since all the Trimoorthies or the Hindu trinity of Brahma, Vishnu and Shiva met together at this place, it was known as Koodiyoor (Koodi in malayalam means meet or join). Koodiyoor became Kottiyoor.So Kottiyoor is believed to be the spot of the ancient Dakshayaga. The auda flowers/ odapoo is considered as the beard of Daksha. Chottanikkara Temple is one of the most famous temples of Kerala and one of the best architecture layouts of historic times. Temple dedicated to Goddess Bhagvathi is located in Ernakulam District of Kerala India. It is the most important Temple among the 393 shrines spread over 3 Districts of Kerala and coming under the administration of Cochin Devaswom Board. It is one of the most visited shrines of Kerala. People with mental illness visits this temple as it is said that Goddess Bhagawati cures the illness of the devotees. It is the most important Temple among the 393 shrines spread over 3 Districts of Kerala and coming under the administration of Cochin Devaswom Board. The Divine Mother known as Rajarajeswari (Adiparasakthi) is worshipped here in three forms Saraswathy in the morning, Lakshmi at noon and Durga in the evening. There is an Idol of Mahavishnu on the same pedestal and so the Deity is called Ammenarayana, Devinarayana, Lakshminarayana and Bhadrenarayana also. Along with Lakshmi & Narayana there are idols of Brahma, Siva, Ganapathi (Ganesh), Subramanya and Sastha on the same pedestal. There are two main temples here. The first one we see as soon as we enter is the temple of Rajarajeswari. The one behind it in a slightly lower elevation is called Keezhekavu, which has Bhadra Kali consecrated there. The Rajarajeswari is worshipped as Goddess Saraswathi in the morning, as Bhadra kali at noon and Durga in the night. This temple opens its doors every day at 4 AM. People believe that Goddess Mookambika of Kollur attends the first worship here before going to her temple. Another peculiarity of this temple is that the Goddess is not fixed to the ground but rests on a bed of sand. Nearby her, is the idol of Lord Vishnu. Hence the devotees always pray to her along with her brother Lord Narayana and chant 'Amme Narayana'.